Manufacturer of a wide range of products which include bolt threading machine, internal pipe threading machine, pipe threading machine, pvc pipe threading machine, rod threading machine and rebar threading machine. Capacity Vary From 1.1/4" upto 2.1/2"
Model IMC-1/4" to 1" , IMC-3/8" to 1.1/2", IMC- 1/2" to 2.1/2"
The Bolt Threading Machine is use to cut the external threads with the help of Tangential chaser. 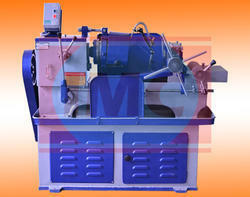 Bolt Threading Chaser is use as a cutter in machine. Bolt remain still, Die-head rotates and different type of threads can be cut such as BSW, UNF, METRIC, UNC, ACME Threads. BOLT THREAD CUTTING MACHINES are designed to give maximum efficiency and reliable performance under the most severe conditions of service with minimum maintenance cost. All the necessary requirements are combined in this model to from the basic fundamentals of correct Bolt thread cutting. All the gears are made of case hardened steel with extra large face with and tooth thickness and cut on hobbing machine for noiseless operation even at high speed. Naturally the are built with high standards of workmanship, material and quality so closely associated with COMPANY TRADITION. Range of IMC Bolt Threading Die Heads. (Bed Type) 3/8" to 1.1/2"
(Bed Type) 1/2" to 2.1/2"
(Bed type) 1" to 4"
Saddle Movement 10" 10" - 12" 12" - 16" 10" - 12"
Bolt Capacity 1/4" to 1" 3/8" to 1.1/2" 1/2" to 2.1/2" 1" to 4"
These machines are truly sophisticated and are engineering masterpieces in their own right. The internal threading machine on offer is manufactured as per industry standards, and stands high on parameters of quality and durability. These are fabricated using high grade raw material, which not only ensures that the machine will be able to resist wear and tear, but also prove to be resistant against breakage and abrasion. A good grade internal threading machine will have a system that is so advanced that little human intervention will be required. This will not only ascertain that the work done is completed with perfection, but will also reduce human effort. The way these machines are fabricated, the quality inspection team, ensures that there are no regular breakdowns, during operation. The internal threading machine offered by Industrial Machinery Corporation will allow for the cutting of 150mm thread length. The speed in the gear box is five, while it can produce up to eighty pieces per hour. While these are the basic specification, being a customer centric company, Industrial Machinery Corporation will also offer the benefit of customization. 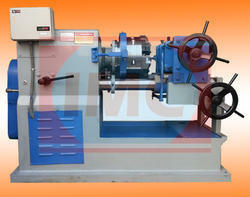 The Pipe Threading Machine is use to cut the external threads with the help of Tangential chaser. Threading Chaser. is use as a cutter. Pipe remain still, Die-head rotates and different type of threads can be cut parallel and taper such as BSPT, BSW, BSP, NPT, UNF, METRIC, UNC, ACME, BSF Threads. IMC MACHINES are designed to give maximum efficiency and reliable performance under the most severe conditions of service with minimum maintenance cost. All the necessary requirements are combined in this model to from the basic fundamentals of correct threading. All the gears are made of case hardened steel with extra large face with and tooth thickness and cut on hobbing machine for noiseless operation even at high speed. Naturally the are built with high standards of workmanship, material and quality so closely associated with COMPANY TRADITION. DESIGN AND WORKMANSHIP: The Industrial Machinery Corporation thread cutting machines are designed to produce quality threads within the tolerance for which they were intended. THE BED: The bed of pillar type which having two pillars made of best quality steel nicely finished and duly hard chrome plated in the most modern hard chrome plating unit. THE SADDLE: The Saddle is fitted on two pillars very precisely. It runs on pillars very smoothly and accurately to the Head Stock alignment. Range of IMC Die Heads. Model 1/4" to 1" 3/8" to 1.1/2" 1/2" to 2.1/2"
1" to 4" 2.1/2" to 6" 4" to 8"
Saddle Movement 10" 10" - 12" 12" - 16" 10" - 12" 10" - 12" 10" - 12"
Threading Capacity 1/4" to 1" 3/8" to 1.1/2" 1/2" to 2.1/2" 1" to 4" 2.1/2" to 6" 4" to 8"
The PVC Pipe Threading Machine is use to cut the external threads with the help of Tangential chaser. Chaser is use as a cutter in machine. It remain still, Die-head rotates and different type of threads can be cut parallel and taper such as BSPT, BSW, BSP, NPT, UNF, METRIC, UNC, ACME, BSF Threads. PVC PIPE THREADING MACHINES are designed to give maximum efficiency and reliable performance under the most severe conditions of service with minimum maintenance cost. All the necessary requirements are combined in this model to from the basic fundamentals of correct PVC Pipe thread. All the gears are made of case hardened steel with extra large face with and tooth thickness and cut on hobbing machine for noiseless operation even at high speed. Naturally the are built with high standards of workmanship, material and quality so closely associated with COMPANY TRADITION. DESIGN AND WORKMANSHIP: The Industrial Machinery Corporation thread cutting machines are designed to produce quality threads within the to lerance for which they were intended. THE BED: The bed is pillar type Threading Machine having two pillars made of best quality steel nicely finished and duly hard chrome plated in the most modern hard chrome plating unit. 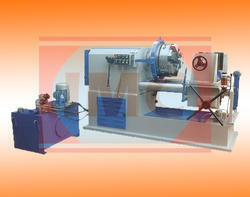 Range of IMC PVC Pipe Threading Machines and Die Heads. Saddle Movement 10" 10" - 12" 12" - 16"
Threading Capacity 1/4" to 1" 3/8" to 1.1/2" 1/2" to 2.1/2"
Rod Threading Machine is use to cut the external threads with the help of Tangential chaser. Chaser is use as a cutter in Machine. The Component remain still, Die-head rotates and different type of threads can be cut such as BSPT, BSW, BSP, NPT, UNF, METRIC, UNC, ACME, BSF Threads. ROD THREADING MACHINES are designed to give maximum efficiency and reliable performance under the most severe conditions of service with minimum maintenance cost. All the necessary requirements are combined in this model to from the basic fundamentals of correct thread. All the gears are made of case hardened steel with extra large face with and tooth thickness and cut on hobbing machiness for noiseless operation even at high speed. Naturally the are built with high standards of workmanship, material and quality so closely associated with COMPANY TRADITION. Rod Threading Capacity 1/4" to 1" 3/8" to 1.1/2" 1/2" to 2.1/2"
The Bar Threading Machine is use to cut the external threads on the bar with the help of Tangential chaser. 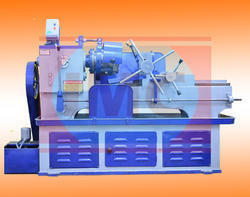 Bar Thread cutting Chaser is use as a cutter in machine. Bar remain still, Die-head rotates. Different types of threads can be cut on the bar such as BSW, NPT, UNF, METRIC, UNC, ACME, BSF Threads etc. Such a company will offer you the amenity of customization, wherein the bar thread cutting machinery will be designed and fabricated as per your specifications. These can vary on aspects such as saddle movement, range of spindle speed, capacity , the number of units a it can produce in an hour and the requirement of power to operate the machinery. As is the case with most bar threading machinery, this one too works with sub parts such as saddles, aprons and beds. These are all designed and fitted in such a manner that they provide hassle free operation and require minimal attention, post purchase. This not only ensures actual value for money, but also reduces the time spent on regular maintenance and servicing. Range of IMC Bar Threading Die-Head. Pillar Type Hydraulic Pipe Threading Machine comes with self opening the die head with head stock gears hardened with power pack, with one hydraulic cylinder for lead screw box nut engaging, one hydraulic pipe clamping cylinder and one hydraulic cylinder for die-head opening with micro switches with automation with control panel. 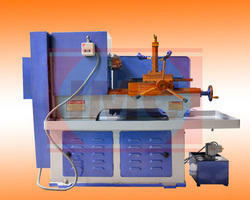 The Pipe Threading Machine is use to cut the external threads with the help of Tangential chaser. 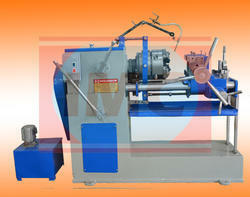 Threading Chaser is use as a cutter in Threading machine. Pipe remain still, Die-head rotates and different type of threads can be cut parallel and taper such as BSPT, BSW, BSP, NPT, UNF, METRIC, UNC, ACME, BSF Threads. HYDRAULIC PIPE THREADING MACHINE is designed to give maximum efficiency and reliable performance under the most severe conditions of service with minimum maintenance cost. All the necessary requirements are combined in this model to from the basic fundamentals of correct threading. All the gears are made of case hardened steel with extra large face with and tooth thickness and cut on hobbing machine for noiseless operation even at high speed. DESIGN AND WORKMANSHIP: The Industrial Machinery Corporation threading machine are designed to produce quality threads within the tolerance for which they were intended. THE BED: The bed is pillar type pipe threading machine having two pillars made of best quality steel nicely finished and duly hard chrome plated in the most modern hard chrome plating unit. (Pillar Type) 1" to 4"
(Pillar Type) 2.1/2" to 6"
(Pillar Type) 4" to 8"
Saddle Movement 12" - 16" 10" - 12" 10" - 12" 10" - 12"
Threading Capacity 1/2" to 2.1/2" 1" to 4" 2.1/2" to 6" 4" to 8"